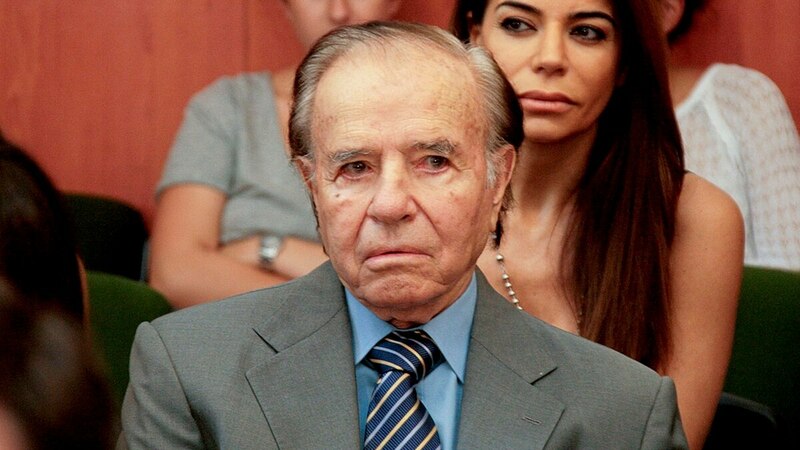 EL EX PRESIDENTE Y ACTUAL SENADOR CARLOS SAUL MENEM HA SIDO ENCONTRADO CULPABLE DEL DELITO DE CONTRABANDO DE ARMAS A CROACIA Y ECUADOR MIENTRAS EL FUESE PRESIDENTE DE LA REPÚBLICA. POR TAL DELITO, MENEM HA SIDO Y SENTENCIADO A 7 AÑOS DE CARCEL Y 14 AÑOS DE INHIBICIÓN PARA OCUPAR CARGOS PUBLICOS. PESE A ESTE FALLO POSITIVO DE LA JUSTICIA, EL SENADOR MENEM SEGUIRÁ LIBRE YA QUE SE ENCUENTRA PROTEGIDO POR SUS FUEROS PARLAMENTARIOS COMO SENADOR NACIONAL. ESTOS FUEROS PUEDEN SE REMOVIDOS POR LOS MISMOS INTEGRANTES DE LA CÁMARA DE SENADORES. ESTO ES UNA BURLA A TODA LA SOCIEDAD. UNA VEZ QUE LA JUSTICIA ACTUÓ COMO DEBE SER, ENCONTRANDO CULPABLE A CARLOS SAUL MENEM DE ESTE DELITO, QUE CONLLEVÓ NO SÓLO EL CONTRABANDO DE ARMAS, SINO LA TAMBIÉN LA VOLADURA DE LA FÁBRICA DE EXPLOSIVOS EN RÍO TERCERO EN 1995 Y LA MUERTE DE ALGUNOS DE SUS OPERARIOS, ESTE CRIMINAL SEGUIRÁ PASEANDOSE LIBREMENTE POR NUESTRAS CALLES. QUE INJUSTICIA SERÍA PARA NOSOTROS QUE ESTE PERSONAJE NEFASTO MUERA EN LIBERTAD Y NO TRAS LAS REJAS. POR ESTO, LE PEDIMOS AL SENADO DE LA NACIÓN, QUE LE QUITEN LOS FUEROS A MENEM, ASÍ CUMPLE SU CONDENA.